Published in CISA’s December 2016 E-Newsletter – Sign Up Here! Hosta Hill, producer of kimchi, krauts, and krautonics, received this year its second consecutive Good Food Award. 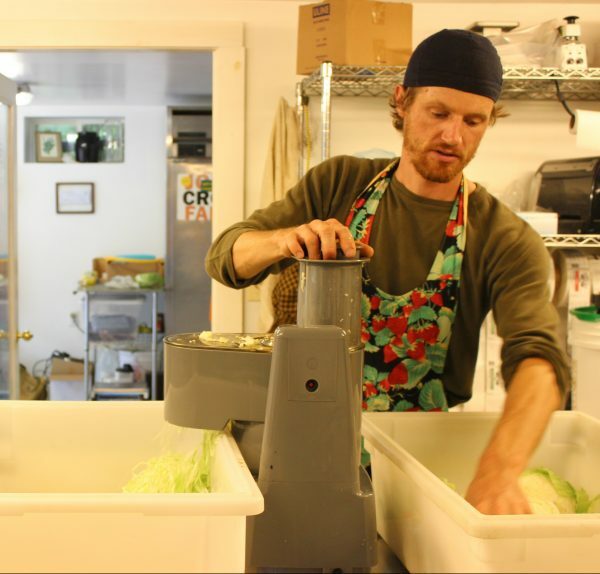 Field-to-ferment experts and Hosta Hill co-founders Maddie Elling and Abe Hunrichs gained national recognition from the San Francisco-based award organization in 2015 with their Kimchi, which is known for its fresh, vibrant taste and crunchy texture, and again in 2016 with their Gochu Curry Kraut, an Indian-Korean fusion made with curry and kimchi peppers. To be eligible for entry in the pickles category, the food’s ingredients must be locally grown and produced without synthetic herbicides, pesticides, and fertilizers. But to win, the food must be both sustainably-produced and delicious. Today, I’m in the Great Barrington village of Housatonic at Hosta Hill’s commercial kitchen watching Abe and two other staff members fill and label bottles of their newly famous Gochu Curry Kraut. When I mention I saw snow on the ground on the way here, Maddie tells me, “This is a great way to get your vegetables in the winter.” The harvest season may be over for Maddie and Abe, but they will stay busy making their value-added products until planting season begins. Maddie and Abe grow much of what’s used in their products, but their cabbages, radishes, onions, carrots, garlic, and hot peppers are supplemented by produce from area farms as needed, such as napa cabbage from Kitchen Garden Farms in Sunderland and green cabbage and onions from Red Fire Farm in Montague. Crate upon crate of cabbages line one wall of the kitchen while a pallet of cabbage waits right outside. Clearly, it all starts with cabbage. I ask Maddie to take me through the processing steps. She explains that it’s actually pretty simple. For a basic sauerkraut, the cabbage is cored, sliced, mixed with salt, and then packed in a barrel to age for 4 to 6 weeks. (The cabbage is fermented by naturally-occurring lactic acid bacteria, so there is no need to add starter cultures). They know it’s ready to be packed when the pH drops below 4.3 and the taste is right. “If it’s too young, it will taste too green—too much like fresh cabbage,” she explains. Next, it’s packed into jars, labeled, and refrigerated. It’s best within 6 months of packing. Over time the product will soften and become more acidic as it continues to ferment, but it’s still perfectly safe to eat. Hosta Hill’s products include Sauerkraut, which contains only green cabbage and salt, and the more exotic variants Crimson Kraut, Gochu Curry Kraut, and Kimchi. The juices of each are bottled and sold as Krautonics, which you can drink straight like a fire cider, add to smoothies or green juices, or use in alcoholic beverages such as a Kimchi Bloody Mary or a “krautback”—the sauerkraut version of a pickleback, where a shot of whiskey is chased by a shot of brine. Krautonics can also be used as a soup base, as a salad dressing, or as a marinade with soy sauce, garlic, and herbs added. The newest Hosta Hill addition is Lacto-Fermented Hot Sauce. Introduced last year, it uses ripened jalapeño peppers and garlic grown by Maddie and Abe. All Hosta Hill products are raw and living foods, full of probiotics. Maddie tells me it’s rewarding “to see how people respond to our products and say how much it’s been helping their health” and to know “that we’re offering a truly healing and delicious product.” She mentions the link between probiotics and digestive health, but also refers to the newer science linking digestive health to the brain and mental health. Hosta Hill is a young business that has met with early success in part due to strong community support. Maddie says, “It’s a really exciting time. There’s a lot of interest and support in local food products, and lots of resources and technical assistance in the Berkshires. It’s a good time to be a business. People want to know where their food comes from.” Maddie and Abe, both passionate about working outdoors, were raising pigs and turkeys and growing vegetables in 2010 before finally committing to sauerkraut and kimchi, which they produced in church kitchens and sold at the Norfolk Farmers’ Market and Northampton Farmers’ Market, educating people about their products along the way. In 2011, they moved to the current property which they rent from Maddie’s parents. 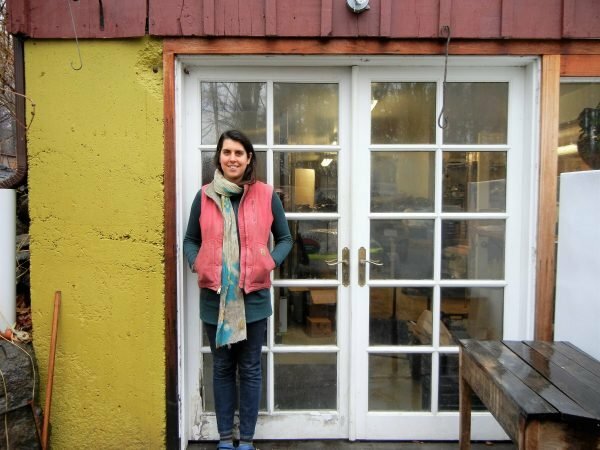 Through a Kickstarter campaign, funding from friends, family, and customers allowed them to build a commercial kitchen below the house. There is a staff of 4, consisting of the 2 owners and 2 part-time employees plus some seasonal help. The business continues to expand its reach. Hosta Hill products can be found in stores in the Berkshires such as Berkshire Co-op and Berkshire Organics and in stores throughout the Pioneer Valley such as River Valley Co-op, Cornucopia, Green Fields Market, and Atlas Farm. Products are also sold at the Tuesday Market in Northampton. In addition, they use Myers Produce, a small Vermont-based distributor, to distribute products to Boston and New York. Maddie says they are working to get into restaurants and cafes through wholesale distribution channels. When she visits a restaurant, she always brings samples and suggestions on pairings for the chef. Maddie says their biggest challenge is a lack of space, both for production and farming. In fact, there are plans underway to move into a new kitchen this summer. Other plans for the business include producing more products (such as the cultured mustard they’re currently developing), growing more of their raw ingredients, and having their organic farm certified. When I ask for recipe ideas for the krauts and kimchi, Maddie rattles off several ideas: sauerkraut served on top of a bowl of stew as a garnish or paired with ham, Gochu Curry Kraut or Kimchi as an appetizer with cheese and charcuterie, and Kimchi or any of the krauts on a sandwich. Their products are available at stores throughout Massachusetts, online at HostaHill.com, or at a number of Holiday Markets such as the Northampton Winter Market, the Holiday Shindy at Shire City Sanctuary in Pittsfield (Dec. 10-11), Carter and Stevens Farm in Barre, MA (Dec. 11), and Berkshire Grown in Great Barrington (Dec. 17) and in Williamstown (Dec. 18).